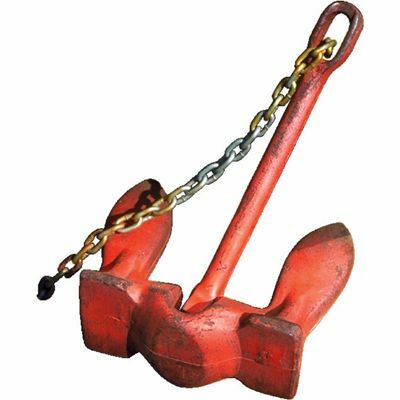 anchoran‧chor1 /ˈæŋkə $ -ər/ noun [countable] 1 TTWa piece of heavy metal that is lowered to the bottom of the sea, a lake etc to prevent a ship or boat movingat anchor The ship was at anchor. We dropped anchor a few yards offshore. The next morning, they weighed anchor (=lifted the anchor) and began to move south again.2 especially American EnglishAMT someone who reads the news on TV and introduces news reports SYN newsreader British English Dan Rather, anchor of the CBC Evening News3 HELPsomeone or something that provides a feeling of support and safety Dad was the anchor of the family. anchor• He was martyred when thrown into the Black Sea with an anchor tied to him.• We dropped anchor a few yards offshore.• Neither parliament nor the law was open, though these provided both soaring fame and a practical anchor for similarly gifted men.• His one serious anchor was the friendship with Madame Phan.• These ancient trees are a spiritual anchor that our culture needs to hold on to.• The weather segments also give the anchors a chance to banter with the weather people and lighten the proceedings.• Finally on the fourth day one of the anchor ropes sheered through and we lost that anchor to the gale.• As she waited, she began to study the anchor cables around her.• He was the anchor for the BBC's nine o'clock news for over 10 years.• The anchors are usually linked by sundry cords and tapes of varying age and wear.weighed anchor• We weighed anchor next morning and sailed down the fiord on a calm sea.